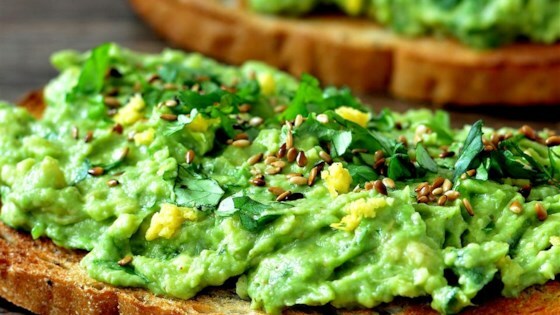 "I like to use this recipe when I have a ripe avocado that I don't want to waste. It is absolutely delicious and a wonderful source of fiber and fatty acids. Feel free to get creative with the ingredients! Substitute cilantro with mint or parsley, or chia seeds with sesame or poppy seeds." This is truly delicious. I've always used lime on avocado toast. What a head slapper of a recipe. Thank you for sharing. This was delicious. The zest adds a lot of flavor. I used a whole avocado (1/2 avocado per slice of toast) and topped each one with a fried egg for a very satisfying breakfast. This ESHA rating is off. An avocado is 21 g of fat per cup, bread is 72 cal per slice. Wow! I used more avocado than it called for, but WOW. I love how lemony this recipe is. The zest and cayenne were nice and even though you don’t really taste the chia seeds they made a nice garnish.